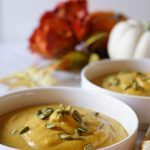 Slow Cooker Butternut Squash Soup - creamy, rich, velvety and so smooth! The flavors are deep and complex & even better.....it's made in the slow cooker! Peel the squash, remove the seeds and chop into 1 inch pieces. Peel and chop the onion and apple also. Dice the brick of cream cheese. Add the squash (fresh & frozen), onion, apple and cream cheese. Measure all of the spices and put them in a small bowl. Stir well to combine and then sprinkle all the spices into the slow cooker. Using a large spoon, stir well - add the honey and stir again. Pour in the vegetable stock and cover. Set the temperature to low. It will take 8 hours and the soup will be done. After 8 hours, unplug and using an immersion blender, blend the soup until it is a creamy consistency. Toast the pumpkin seeds - using a dry pan over medium-low heat, toast the pumpkin seeds until they are a golden brown - takes about 5 minutes. Remove from the pan immediately - if you leave them in the pan, even though you've removed the pan from the heat, the residual heat may burn the seeds (happens really quick!). Serve topped with toasted pumpkin or pine nuts, delish!